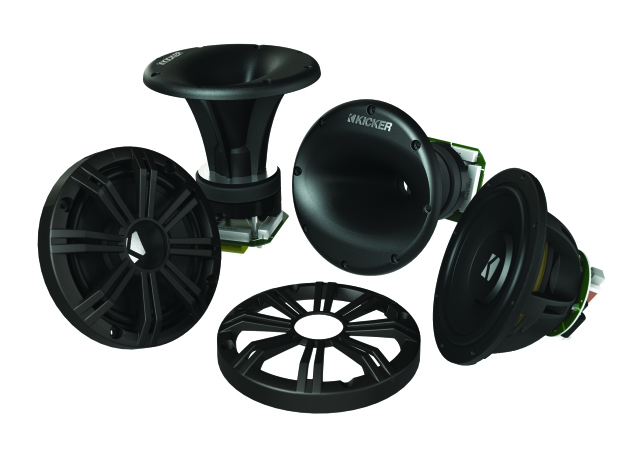 STILLWATER, USA – Boaters and wake-sports enthusiasts alike will enjoy the KICKER® KMS67 HLCD Tower Component System, the much anticipated upgrade to the world’s first horn-loaded, compression-driver component system that delivers a whole new level of audio for the entire watercraft and beyond. Providing maximum sound quality up close and especially at a distance, the KMS67 consists of two 6-1/2-inch, high-efficiency midrange speakers featuring lightweight, dual-stack neo-motor technology and cast-aluminum baskets. It also includes a pair of horn-loaded, two-inch compression drivers with titanium diaphragms and phase plugs for ultimate clarity and volume. The advanced tractrix horns (60-degree-vertical-by-90-degree horizontal) deliver a natural-sounding, “non-peaky” performance out to the skier, wakeboarder or wakesurfer. Integrated crossovers for the perfect musical blend complete the ultimate marine system and take the guesswork out of wiring. KICKER tower speakers are engineered with the highest design standards and are a breeze to install, fitting snugly into 6-1/2-inch speaker cans. Both midranges and horns are designed to fit can enclosures with identical hole diameters and bolt patterns. UV treatments on the midranges’ injection-molded cones, water-proof Santoprene® surrounds, baskets and grilles help the tower system tolerate freshwater or saltwater environments. These speakers endure most any weather conditions with splash- and spray-resisting, sealed motors and cones. Additionally, Authorized KICKER Dealers carry KM-Series Empty Tower Enclosures for 6-1/2-inch drivers, the ideal host for KICKER HLCD Tower Components or any KICKER 6-1/2-inch speakers on a boat tower.